The Afghan National Police (ANP; Pashto: د افغانستان ملي پولیس‎; Persian: پلیس ملی افغانستان‎) is the national police force of Afghanistan, serving as a single law enforcement agency all across the country. The agency is under the responsibility of Afghanistan's Ministry of Interior Affairs, headed by Wais Barmak. The ANP had about 157,000 active members in September 2013, which was expected to reach 160,000 by the end of 2014. The Afghan police traces its roots to the early 18th-century when the Hotak dynasty was established in Kandahar followed by Ahmad Shah Durrani's rise to power. It was reorganized in 1880 during Emir Abdur Rahman Khan's reign. The current ANP was established after the removal of the Taliban government in late 2001. Several government agencies from the United States as well as Germany's Bundespolizei (BPOL) and the United Kingdom's Ministry of Defence Police provided most of the early training. In 2007, the EU-led mission (EUPOL Afghanistan) was heading the civilian policing in the Kabul area but by 2005 the United States established training programs in all the provinces of Afghanistan. Since 2009, the Afghan National Police began receiving advanced training from U.S.-led NATO forces. The modern Afghan police force has its origins to the Hotaki and Durrani Empire in the early 18th century, and over the centuries it was slowly modernized. In 1950s a group of army officers were reassigned to the police forces to develop a new cadre and modernize the police organization. And early 1960’s Five of the top police students from the Kabul police academy or sent to Munich Germany to get their masters degrees in criminology and police work. Among those were Farouq Barakzoy, Farouq Yaqobi, Assadullah Ahmadzai, Sidique Wahidi, Saadullah Yusufi,and others. The agency remained in existence throughout the Saur Revolution and Soviet occupation that began in 1978/79 until Kabul fell in 1992 to the insurgents; the country descended into civil war and then came under the heel of the Taliban, who enforced a primitive and barbaric justice. After the collapse of the Taliban regime in late 2001, there was little in the nation resembling a functional police department as private armed militias of warlords quickly filled yet again the vacuum left behind by a lack of central governance. The Ministry of Interior in Kabul, under the new Karzai government of the Islamic Republic of Afghanistan, exercised little control over provincial police structures and was unable to effectively secure the remote provinces. Most of these problems were established after the Fall of Kabul in 1992, when the Soviet-backed government of Najibullah fell apart and the country entered into anarchy and chaos. From 1978 to 1992 the Afghan police had firm control over the country, much thanks to the Soviet Union and other factors related to the Democratic Republic of Afghanistan or the Soviet war in the country. Traditionally, police officers were poorly paid, recruited or conscripted from the poorest classes of society and frequently held in contempt by the communities they served. Compounding these factors, over two decades of unrest had also resulted in an illiteracy rate conservatively estimated at over 70% for police recruits. Although early efforts had trained 35,000 officers in basic recruit schools during 2003 and 2004, this training was insufficient to strengthen the structures and senior command levels needed to create an effective police force. 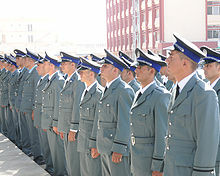 Germany, as lead nation for police under the Bonn II Agreement, concentrated its efforts on setting up the Kabul Police Academy and drafted the long range blueprint for restructuring the police services. Except for Kunduz Province which had a Provincial Reconstruction Team (PRT), Germany's program had only limited reach into the provinces. As the US Department of State International Narcotics and Law Enforcement Affairs Bureau's (INL) activity at this time was limited in resources and scope, the US Departments of Defense and State, in 2005, decided to shift the implementation of the police training and equipment program to the Office of Security Cooperation-Afghanistan (OSC-A), under the authority of the Commanding General, Combined Forces Command (CFC-A). In 2006, OSC-A became the Combined Security Transition Command – Afghanistan (CSTC-A) keeping the OSC-A mission. ANP commander marching to greet distinguished visitors at the Afghan National Police Academy (ANPA) in 2010. The 2005 changes led to an increased impetus to implement significant reform programs, particularly the reform of higher staff levels at the Ministry of the Interior, the placement of police mentors throughout the country, substantial pay increases in the police salary plan and an impending, complete restructuring of the police payroll system. A nationwide reassessment of infrastructure and equipment needs was also undertaken, followed with the distribution of critically needed weapons, ammunition, vehicles, and office/dorm furniture. Although progress has been made in the areas of infrastructure, equipment and payroll distribution, these programs would take some time to reach fruition. Headquarters of the ANP in Panjwayi, Kandahar Province. In the late 2000s the number of ANP officers getting killed in the line of duty jumped very sharply, with over 1,600 officers being killed in the years 2008 and 2009. By 2012, Afghan officials estimated that about 200 police officers are killed in the line of duty each month. Also see List of Afghan security forces fatality reports in Afghanistan. In the meantime, ANP members have been accused of massacres and corruption. In 2012, one ANP from Paktia and two from Logar were arrested for kidnapping children. The police confessed to the crime, while one of the kidnapped boys said, "I received a phone call from the policemen who introduced themselves as my friends. They offered me a ride. I went unconscious after they dragged me into a car." In January 2013, a police commander in Uruzgan Province was accused of killing 121 local people. He fled to Ghazni Province and authorities said they will soon arrest the fugitive. In early 2012, the Ministry of Interior provided 300 armoured vehicles to the 1st border police brigade stationed around the porous Durand Line, in Nangarhar province. Col. Mohammad Ayub Hussainkhel, the 3rd Border Police Brigade Commander, said "the border police are now capable of maintaining better security for the Durand Line and to prevent infiltration of militants into the province from Pakistan." In February 2012, the United States promised that it would support the government of Afghanistan to protect its sovereignty and effectively control its borders. At a 2012 meeting with Danish Prime Minister Helle Thorning-Schmidt in Chicago, US President Barack Obama said, "We are going to be consulting with not only Denmark but our other allies in making sure that is a smooth transition and one that is sustained, where we continue to help the Afghan government support its own sovereignty and effectively control its borders." 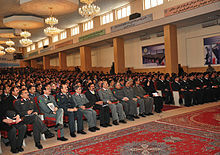 In April 2013, the Ministry of Interior announced a strategy to strengthen and make the ANP professional with support from the international community. It is a ten-year plan designed to make the ANP become more closer to a Western standards police force. An Afghan National Civil Order Police (ANCOP) honor guard stands in formation at the Ministry of the Interior in 2010. The Afghan Uniform Police (AUP) is the primary civil law enforcement agency in Afghanistan. The ANP is divided into five regional commands (north, south, east, west and central) as well as the Afghan National Civil Order Police (ANCOP). Other forces falling under the command and control of the ANP include local traffic police departments as well as the fire department. The Afghan Highway Police (AHP) was a sub-department of the national police that is currently dissolved with only speculation of return. Their primary responsibility was to provide traffic safety and overall security of the "Ring Road" highway that connects most of the major population centers in Afghanistan. Most of the personnel, equipment and facilities that comprise the highway police were reorganized under the uniform police. Afghan Border Police (ABP) at Islam Qala in western Herat Province. Provide border security patrols within a security zone that extends 55 km into the territory of Afghanistan. Provide immigration / visa services and investigate immigration violations. Establish and maintain border crossing points, to include all international airports within the country. Provide perimeter, building, aircraft and passenger security of international airports. Arrest and deport illegal persons. The Criminal Investigation Department (CID) is staffed with 4,148 investigators spread over the nation with the majority in Kabul. They are tasked with investigation, crime scene forensic procedures, documentation of crime, and assisting other agencies to include assistance through the crime lab housed at the Ministry of Ministry of Interior Affairs. There are a number of police districts throughout Afghanistan for example Police District 9 covers about 24 km2 of Eastern Kabul. 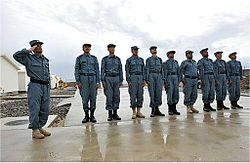 The United States Army Corps of Engineers is building nearly 200 modern police stations for the Afghan National Police. The total cost of the project was reported to be over $600 million US dollars, and each police station is said to cost about $6 million. The main ANP training facility in Kabul was established by the German police mission and is now led by the United States. Col. Abdul Eliam, Chief of Police of Helmand province. Brig. Gen. Ahmed Fahim Qayem, commander of the Central Unit, Police Zone 101. Female ANP officers stands at attention during a pass and review formation before the start of the International Women's Day ceremony at the Ministry of Interior in Kabul on March 4, 2010. Some ranks are known by several names. These disparities are most-likely caused through different translations from Dari to western languages as well as being interpreted differently by inherently unrelated agencies such as the U.S. military versus the German Police. The role of the "sergeant", or non-commissioned officer, is not well developed and is often overlooked by the prestige associated with being a regular, or commissioned, officer (lieutenant or higher). This lack of emphasis on the subordinate ranks has also stunted the clear definition of ranks as well as their roles and responsibilities. The ranks of 3rd Lieutenant and Senior Captain are being phased out after the Ministry of Interior underwent a Rank Reform process in which they eliminated a disproportionate number of senior-ranking officers within the police. These ranks are believed to have served as a way to better distinguish and balance out an extremely top-heavy leadership corps. ANP cadets stand in ranks while they receive instruction before boarding buses headed for Kabul International Airport on their way to Turkey for a six-week advanced NCO training course. The original formation of police and security forces saw an overwhelming majority of senior-ranking personnel due to disorganization and corruption. It was not uncommon to find someone holding a senior rank, such as lieutenant colonel, possessing minimal qualifications or having little to no responsibilities for a rank of that stature. It was a period of total mismanagement that allowed people to use bribery and other forms of influence to gain prominent positions in the national police force. It was soon evident that the organization was “top heavy” and thus ineffective in conducting the daily duties expected of the police. Furthermore, many leaders inside the Ministry of Interior were guilty of human rights violations and other forms of blackmail and corruption. There was an obvious need to reorganize and repair this broken ministry. MOI began a Rank Reform initiative in October 2005 to completely overhaul and replace its existing leadership structure and composition. The United Nations and ISAF forces conducted background checks on all eligible candidates in attempt to thwart the acceptance of MOI leaders with past human rights violations or records of corruption. Concurrent with rank reform, salary reform was also implemented to match their pay with that of their equivalent counterparts in the Afghan National Army who had been receiving higher pay from their inception. Despite rank and pay reform, it is still very common to see a disproportionate level of senior-ranking officers within the police force. Although these officers have been "reformed" and their rank and pay adjusted to "sergeant", for example, they will still wear the rank of "captain", or whatever they feel is appropriate, in an effort to retain more authority. Corruption, bribery and treason are also still very common in the national police. Widespread corruption in all levels of the ANP has long been a major problem for the combating of the Taliban insurgency. It was reported in 2008 that Taliban fighters of both high and low rank have been able to quickly buy their release from police custody with bribes ranging from $100–$10,000. Drug use, defections to the Taliban and sexual harassment of female officers within the ANP were also reported. Due to the high level of corruption, the Afghan government began to send the relatively un-corrupted Afghan National Army to more sensitive scenarios. In January 2013, Hakim Shujayee, a Hazara police commander in Uruzgan Province was accused by higher authorities of killing 121 local people. He fled to Ghazni Province and the Minister of the Interior promised to bring him into custody very shortly. It was reported in February 2010 that police in Afghanistan are largely illiterate, approximately 17 percent of them tested positive for illegal drugs, and they were widely accused of demanding bribes. Attempts to build a credible Afghan police force were faltering badly, according to NATO officials, making it difficult to build a capable national force. The number of the Afghan National Police was reported at 157,000 in September 2013, which is expected to reach 160,000 by the end of 2014. The primary vehicle of the ANP is the four-wheel drive, diesel, 4-door Ford Ranger (and Ranger SORVs), provided by the United States by the thousands. Other vehicles include Humvees, diesel-powered variants of the U.S. consumer Nissan Frontiers, Toyota Hilux pickup trucks imported from Thailand, and Volkswagen Transporter T4/Eurovans, as well as Yamaha motorcycles donated by Japan. Older vehicles, like the UAZ-469 all-terrain vehicle, were obtained from the Soviet Union. Uniforms and body armour are sometimes mismatched and poorly distributed. Most police personnel are issued at least one uniform that is traded out for warmer/cooler uniforms depending on the season. It is common to find a varying array of blue, green and gray uniforms amongst the police due to different manufacturers and the rapid growing of the force with many people joining. Some police have resorted to having their own uniforms custom made. Body armour and helmets are seldom given to individual soldiers and are often given out on an as-needed basis. The composition of this equipment varies between American, Russian and Chinese military grade equipment to 3rd party equipment that provides little-to-no real protection. Plans to upgrade weapons and uniform are being drafted by the Afghan government. Typically the ANP badge is worn on one shoulder and Afghanistan's flag on the other. In August 2010, an order was placed for 2,526 M1152A1 Humvees with B2 armor kits, for the Afghan National Police and the Army. ^ a b c Another female police officer shot in Afghanistan, Mirwais Khan and Amir Shah, Associated Press (AP). September 15, 2013. ^ a b Pellerindate, Cheryl (May 23, 2011). "Afghan Security Forces Grow in Numbers, Quality". American Forces Press Service. United States Department of Defense. Archived from the original on 2013-08-20. Retrieved 2011-07-10. ^ a b Nordland, Rod (2 February 2010). "With Raw Recruits, Afghan Police Buildup Falters". The New York Times. Archived from the original on 2010-02-04. Retrieved 29 January 2014. ^ Jonathan Steele (2002-02-26). "Kabul's loss". The Guardian. London. Archived from the original on 27 February 2009. Retrieved 2009-03-21. ^ "Afghanistan to have strong air force by 2016: Azimi". Pajhwok.com. 2012-12-02. Retrieved 2016-05-20. ^ Policemen detained for kidnapping children Pajhwok Afghan News. January 8. 2012. ^ a b "Shujayee to be held in a week: Patang". Pajhwok Afghan News. 5 January 2013. Archived from the original on 16 February 2013. Retrieved 2013-01-05. ^ "Re-demarcation of borders with neighbours suggested". Pajhwok.com. 2011-10-19. Retrieved 2016-05-20. ^ "Strategy to make police professional unveiled". Pajhwok Afghan News. April 11, 2013. Retrieved 2013-04-13. ^ "US to bolster Afghan border, customs training". MSNBC. Archived from the original on 2011-01-06. Retrieved 2011-01-13. ^ Starr, Penny (January 4, 2011). "Obama Is Sending Border Officers from DHS--Which Has Failed to Secure U.S.-Mexico Border--to Help Secure Afghan-Pakistan Border". Cybercast News Service. Archived from the original on 2011-01-07. Retrieved 2011-01-13. ^ Coldstream 2016, p. 46. ^ U.S. spending $600 million on Afghan police stations, McClatchy. February 22, 2010. ^ Johansen, Per Anders; Tor Arne Andreassen (29 September 2008). "Police face huge training challenges in Afghanistan". Aftenposten. Archived from the original on 2008-09-30. Retrieved 2008-09-30. ^ "For U.S., Vast Challenge To Expand Afghan Forces". NPR. Archived from the original on 2010-04-21. Retrieved 9 February 2010. ^ "Afghan Forces Getting HMMWVs". Archived from the original on 18 August 2010. Retrieved 2010-08-17. Guards, Coldstream (2016). 10 Years in Afghanistan. UK: Coldstream Guards. Wikimedia Commons has media related to Afghan National Police. Police Transition in Afghanistan Donald J. Planty and Robert M. Perito, USIP, February 2013. This page was last edited on 25 April 2019, at 17:53 (UTC).